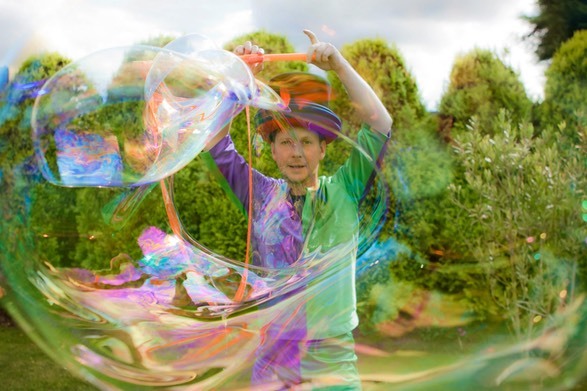 From village fetes and town festivals to huge events like Glastonbury Kids' Field, WOMAD and the World Scout Jamboree, Sutton-based Bezerkaz Circus have performed jaw-dropping tricks, made gigantic bubbles and taught spectacular circus skills all over the UK. Now Bezerkaz' amazing repertoire of skills and tricks can bring an exciting new dimension to children's parties and events with their own brand of�children's entertainment, circus skills parties, circus workshops, giant bubble making, stiltwalking and much more. Set up in 2001, Bezerkaz have years of experience working with kids and also specialise in workshops for children with special needs. "We offer an incredible variety of tricks for children’s parties and are much more than just �children’s entertainment," explains owner Shaun, who is a PGCE-trained teacher and has recently become a dad for the second time. Bezerkaz can also meet and greet on stilts, perform bubbles, make balloon models, juggle fire and offer a clown show, all helping to make your event an unforgettable and educational experience. Bezerkaz Circus are offering Local Mums �15.00 off any booking for a party (1hr-2hr). (The usual price is between �135 - �200). So if you would like to add a jaw-dropping dimension to your child's party or event, why not give Shaun at Bezerkaz a call?